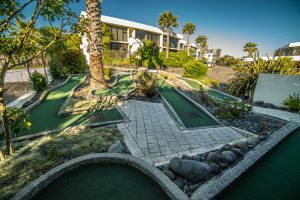 SUN PACIFIC VILLAS is a world class timeshare resort complex situated on the sun drenched shores of the Bay of Plenty in Mount Maunganui. The resort faces north towards the sea and basks in all-day sun, while being sheltered from the southwest winds. There is a definite "club" feeling about timeshare, with people mixing easily, and this is encouraged with the weekly 'happy hour' in the owners lounge, which is often followed by a group dinner outing. However if solitude or privacy is your desire, no-one will disturb you in your retreat. Everything is provided in the villas except for your food and drinks. There is a full supply of linen, crockery, and kitchen equipment. Washing machine, dryer, dishwasher, microwave, 2 TVs (10 Sky channels plus Freeview), and a DVD/CD multi-media unit are in each apartment. The furnishings are superb with luxurious lounge suite and full dining table. There is parking for one car per unit on-site, and extra parking on the roadside. Each villa has a seaward facing, sun deck furnished with outdoor furniture. Amenities close by include the Tay Street Cafe next door for nice meals and coffees, and also a dairy selling basic supplies and newspapers etc. For those who like some activity, there is plenty to do and plenty of equipment provided free of charge to do it with! 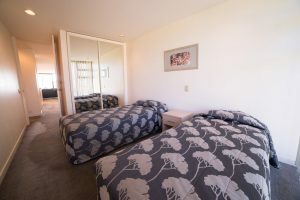 The resort has memberships at 2 local golf courses for which there is a small nominal charge, but the golf clubs are supplied free as is all the other sporting equipment. The on-site minigolf course has putters provided, as are racquets for the full size and mini tennis courts. 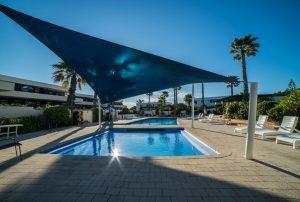 Surfboards, bikes, sauna, spa pool and heated swimming pools, barbecues and children's playground all there for your use. Inside the owners lounge there's a pool table, table tennis and library. A masseuse is available on Wednesdays, by appointment, for a relaxing massage for you for a small charge. All this is on-site! 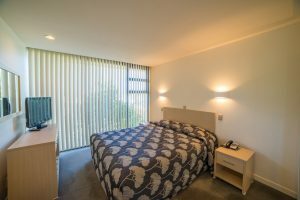 Nearby is the amazing range of activities and shopping that the Mt Maunganui and Tauranga area is famous for. Restaurants abound and the sightseeing is legendary. Game and line fishing trips are close by, and walks around and up the Mount are very popular. Sun Pacific Villas is proud to be N Z's top RCI Gold Crown Resort. Gold Crown Resorts are in the top few percent of the world's resorts. The very high standard of management at Sun Pacific Villas is reflected by these awards, and Sun Pacific is the ONLY resort in the whole Asia-Pacific area to have achieved Gold Crown status every one of the 20+ years the award has been in existence. The resort is affiliated to Resort Condominiums International (RCI), and Dial-an-exchange (DAE) exchange companies and thus provides members with access to over 4000 resorts worldwide through the exchange systems, and other benefits.